The Lozells Community Awards were first held about 7 years ago and have proved to be a huge success over time. The nomination process is done by residents who identify Lozells’ unkown and unsung heroes. This is then collated and the final winners are picked by a special panel of judges. So, on the evening of Tuesday, the 19th July 2016 at 6pm, the Lozells community held awards in honour of organisations and individuals who excel in their service to Lozells and it’s people. And it was double winner for us at the Lozells Community Awards Ceremony, last night. 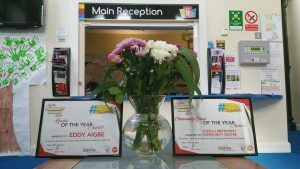 We one the community group of the year award and the leader of the year award by one of our own – Eddy Aigbe (Centre Manager). We are very proud and honoured for this recognition, and we continue to seek more ways to serve our community. After all, we are “In The Community, For The Community”.